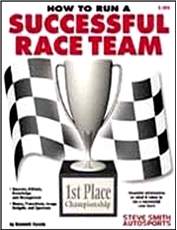 This book is full of essential information on what is takes to run a successful race team. Suited for both the well established team or the grassroots racer, it covers key topics such as team organization, and structure, budgeting and finance, raising money, team management, team image, goal setting, scheduling, and coping with day to day realities of a racing life style. A must for team owners, crew members, drivers and responsible individuals within the race team.